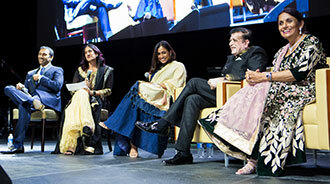 The Tampa Bay Chapter of Ekal Vidyalaya Foundation of USA raised about $224,000 on March 2. The money raised is enough to fund 613 one-teacher schools for needy villages in rural India. Versatile singers Dipayan Banerjee and Madhuraa Bhattacharya drew an audience of about 450 to the India Cultural Center. The Ekal Vidyalaya Foundation (www.ekal.org) strives for holistic development of villages through empowerment of tribal and rural communities in India with basic education, digital literacy, skill development, health awareness, learning modern and productive agricultural practices, and rural entrepreneurship. As a tax-exempt, non-profit organization, Ekal supports and runs non-formal one-teacher schools operating on a minimal $1-a-day budget in India. “Great music, great evening and fantastic food ... and a very organized event,” said Nainan and Dr. Devyani Desai. At least 24 families and corporate entities came forward to be Grand Sponsor level supporters, each contributing $5,000 or more. Uday Lele, a business leader and speaker, gave a moving and inspirational key-note address and generously pledged 100 schools. Lifetime supporters Dr. Yashwant and Padmaja Ginde provided a detailed account of their visit to Ekal schools. Their personal experience of ground realities, challenges and achievements of the organization was invigorating. They renewed their pledge of 100 schools for 2019. The fundraiser is part of a national effort by Ekal Vidyalaya and was co-sponsored by the trustees of India Cultural Center (Tampa), Florida Association of Physicians of Indian Origin (FAAPI) and Punjabi Association of Tampa. Two teams of musicians – The Heartbeat Group and the Vishwanath Batunge Group, are visiting 70 cities over the course of four months to raise funds and awareness for the Ekal movement. The dedicated core executive committee of the Tampa Bay chapter – President Umesh Choudhry, Vice President Malti Pandya, Secretary Sanjiv Jain, Treasurer Anuja Bhutada, Florida President Jawaharlal Taunk, Florida Vice President Vijay Patel, Florida Secretary Kaushal Chari, and former National President, Chandresh Saraiya along with their dedicated group of volunteers, organized the Tampa event. The Tampa program was the second after Ocala, which raised close to $30,000. The team went on to the following cities wrapping up their Florida segment on March 15. Drs. Kiran and Pallavi Patel with their children. 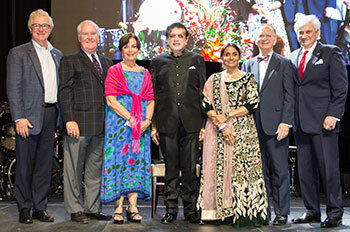 Nearly 3,000 people attended the 70th birthday celebrations for global philanthropist Dr. Kiran C. Patel March 9 at Yuengling Center (USF Sun Dome) in Tampa. Local dignitaries, including the mayors of Tampa and Clearwater, honored Dr. K’s charitable endeavors. 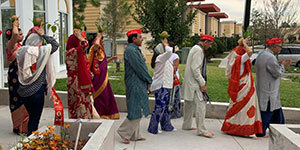 The event was organized by the Gujarati Samaj of Tampa Bay and India Cultural Center. The Sindhi community of Central Florida held Pran Pratishta of Lord Sai Jhulay Laal on March 10 at Maa Durga Sri Sai Temple in Orlando. More than 300 people attended the festivities.